There’s a word that keeps coming up when talking to the leaders of some of Detroit’s boutique marketing firms. Look it up on Dictionary.com and you’ll see why. "Nimble: Quick and light in movement; moving with ease." "Nimble: Quick to understand, think, devise." In Detroit’s ever-changing economy, smaller marketing firms are experiencing the benefits of remaining small. It allows them to respond and adapt to the market as it evolves. As more and more businesses open throughout Detroit, albeit the vast majority of them in the city’s greater downtown, it follows that more and more boutique marketing firms are popping up to help tell their stories. Lovio George is a full-service in-house advertising studio and PR firm. They know a thing or two about running a boutique agency in Detroit; partner Christina Lovio-George first opened the firm here in 1982. She likes to say that she opened her doors while the rest of the moving trucks were going in the other direction. The company has thrived in Detroit ever since. They’ve weathered the ups and downs of the Detroit economy. They’ve scored numerous national accounts, yet they maintain a local presence, too. They have benefited from the past few years of increased development, even with the new marketing firms that have opened as a result. They don’t mind the competition at all. "It shows that Detroit is a place where people want to do business," says John George, Vice President and Creative Director at Lovio George. "There’s enough happening here for more of us. I’m encouraged by it." One of those new firms is SAGA Marketing. Founded in 2015 by business partners Eric Thomas and Marcus Burrell, SAGA is a prime example of remaining nimble. The company adds and subtracts contractors, depending on its workload. At one point, they had 40 contractors; at another it was just the two principals. Eric Thomas and Marcus Burrell's firm SAGA Marketing has experienced a lot of growth since its founding in 2015. Thomas expects their list of clients to grow this summer. And since they’ve passed the three-year point of being a business, SAGA is going to begin telling its own story in order to get more business. "We’re about to shift into sales mode. We get a lot of work by word of mouth, but now we’re going to be more active in our growth strategies and plans," Thomas says. "As a creative, you get swept up in the idea of only doing creative work, but that’s not always the case. Business is business, and firms come and go because creatives focus only on the creative end." Much of SAGA’s business so far has been focused on Detroit and its residents. Thomas, a native Detroiter himself, is a strong believer in Detroiters telling their own stories, and in representation. Often critical of the way Detroit is marketed, Thomas made waves when the "Metro Times" published his "Why I Hate Detroit" essay. It pokes and prods the narrative of Detroit’s current "renaissance," one that’s largely contained to the increasingly white and moneyed residents of greater downtown while all too often failing to reach the majority black population throughout the rest of the city. The key, he says, is to let Detroiters tell their own stories, and not from a top-down perspective. "Just because Detroit is hot, people want to capitalize on it. They want to sell its grit but not understand where the grit comes from. Grit is not a veneer," Thomas says. "Just because someone’s an art director here doesn’t mean they’re going to have the perspective of long-time residents. And that might not be in your job description. But maybe it’s your job to talk to them and elevate their perspective." Even as SAGA seeks to grow its client base, Thomas plans to remain true to his convictions. He believes that there’s a way to be a marketing firm that’s honest and not one that sells people things that they don’t need. SAGA chooses its clients carefully and aims to continue to maintain that balance. And if that means a handful less clients, so be it. "We belong to us. If we start manipulating just for a sale, we’re hurting our own people. There is a moral obligation to tell the truth," Thomas says. "Does it cut out a portion of our clients? Sure. Do I want to work with people that are assholes? Absolutely not." The owner of another relatively new agency also believes that Detroit’s marketing firms should be more representative of Detroit. Billy Strawter, Jr. started the full-service digital marketing firm MILO Detroit in 2016. It has since grown to 18 employees. Strawter is currently weighing expansion options and looking at cities like Atlanta, Chicago, Houston, and New York as locations for additional offices. Still, he says, MILO will remain rooted in Detroit. Business is good here. And it’s home. "For Detroit, it’s an exciting time. There are so many opportunities and enough business for everyone," says Strawter. "But the challenge for Detroit is that there’s still a gap, a lack of people of color working or running agencies. It’s important to have diversity, representation." Strawter himself visits Detroit schools, speaking to the students and letting them know about the opportunities in marketing. There’s a lot of creativity in the city. It’s time to unlock it. "We need more Detroiters in marketing," he says. "So you have to get out there and introduce people to the industry, go out to schools and talk about the opportunities." The MILO firm works with both national and local brands, the former of which is the impetus for expanding to another city. Leading up to its formation, Strawter tried his hand at starting a number of similar firms, yet none of them stuck. He took the lessons learned from failing and applied them to MILO. He found success in not specializing in one facet of marketing, like social media, but adding services like web development, ad campaigns, and television broadcast spots. Consultancy, he says, could be the next big step. "It’s when people end up being laid off from big agencies and transition into freelance work, which transitions into it going well, and then it’s, 'Now I need more people,'" Strawter says. "All of a sudden you have 18 hires." 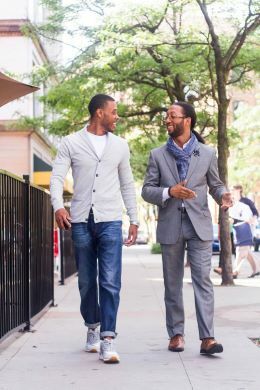 Photo of Eric Thomas and Marcus Burrell by Nailah Ali. Courtesy of SAGA Marketing.